Pegasus Mail is an email client that allows you to download your email onto your computer. Unlike competing software programs, Pegasus Mail is pretty basic. Pegasus Mail can run by itself on your computer, or with Mercury Mail Transport System on a network. The program is intended to make your email management much easier and to allow you to have total control over your email experience. The question, of course, in this Pegasus Mail review is whether or not the program will live up to user expectations, or not. In my experience, the program did not perform as well as competing programs. Pegasus Mail is easy to install and set up on your computer. The program, like many other email clients, downloads from the website. It then self-extracts. Once Pegasus Mail has extracted, it will install on your computer. Then, you will be prompted to enter information about your email, the email server, and your user name and password. The program will then take you to the main screen. While Pegasus Mail claims to be easy to use, I found that it was counter-intuitive. This could be because I’ve been a long-term Microsoft Outlook user when it comes to my email client. I found myself really wanting to like Pegasus Mail; however, I found that it wasn’t as intuitive to me as other mail programs like Thunderbird. Pegasus Mail does try; it has a graphical interface intended to help the user navigate the program’s many features. The program is also multilingual, meaning that if English is not your first language, and either French, German, or Italian is the language that you use, you can still navigate the program without there being a language barrier. As already mentioned, Pegasus Mail is available with English, German, French, or Italian Interfaces. Create form letters that you will address to mutliple recipients using the MailMerge feature. Create multiple folders, and have the ability to have folders available to you on your desktop. Two views – multi-pane mode (as depicted in the screenshot above) and classic mode. Support for all mail protocols. Filtering for spam based upon Baysian filtering. Multiple addressbooks with the ability to create nicknames. The ability to work offline and send mail later. Access to a list of recently used addresses. The ability to view attachments inside the program. The ability to create automatic replies and automatic forwarding. A message reader that handles wrapping. Support for Novell NetWare local area networks. Glossaries that allows you to store commonly used texts. The ability to use the program with multiple users on the same machine and over networks. Pegasus Mail and Mercury are both free for non-commercial use, with Pegasus Mail being a completely free program. While I did not enjoy the program, someone who needs a very high level of security on his or her email would probably want to use this program in lieu of something like Thunderbird. The program gives you a lot of security for free software. Pegasus Mail is supported by a community. There are blogs, forums, downloads, overviews, and even a Wiki covering both Pegasus Mail and Mercury. Just about any question you can come up with is covered within the User Support community, either by the creators of the program or by other users of the program. Finally, if you cannot find a solution listed in the community, and you have found a bug, you can email for tech support. Is Pegasus Mail for You? Pegasus Mail is for you if you need a mail program that is incredibly secure. If you need a mail program with alternate language choices, Pegasus Mail may be the program to meet your needs. 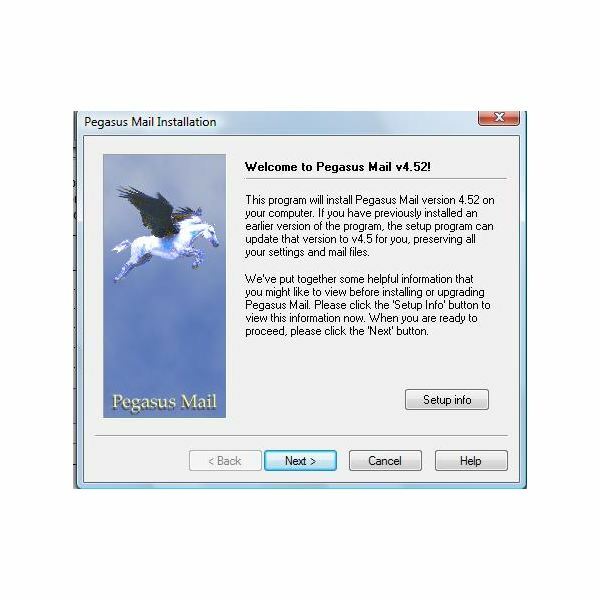 Pegasus Mail is not for you if you like the interfaces of programs like Thunderbird or Outlook. Because the program is pretty straightforward, and doesn’t have any calendar or task features, the program is not for you if you like to have all these features in one program. Otherwise, you may find Pegasus Mail to be sufficient for your needs.